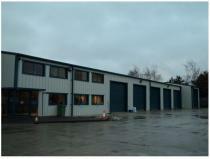 This first example is a combined industrial unit and office space built. 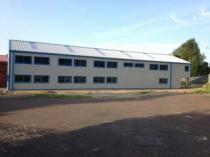 The building is finished in grey steel cladding with blue highlighting. The building is two storeys high with windowing on the exterior walls and skylights on the roof for additional light making the whole building very light and airy inside. This is a relatively large unit specially designed to work both for office space, warehousing and production allowing the whole company to work within one premises. This second example is also over two storeys. This picture was taken as the sun was setting on a wet evening and obviously steel constructions have to be built to high standards to cope with British weather. In the picture you can see, the high loading bays doors that give access to the main storage area. The doors allow easy access by high-sided vans and mid-sized lorries for loading and unloading. To the side of the loading bays is the office space set over two storeys. This is created internally via a mezanine floor giving a full high storage area and two-level administration area showing the flexibility that can be achieved with a steel-framed design. The building is insulated and presented in cream steel cladding with contrasting brown guttering and external drainage used as highlights.